It must be automatic, when using the EditorFor family of methods. It must always work for any complex model. It must round-trip the data entered, even if the data is an invalid date. It must be self-contained. That is, it should not require a script at the top of the page to work. Some demos fail to work for complex models, and most require a surrogate script at the top of the page. We'll see how to avoid those problems in the coming sections. I will be assuming that your project already has jQuery and jQuery UI. The ability for MVC to automatically pick an editor based on the data-type has been covered at length before, just search Google for "EditorTemplates" if you are looking for examples. Navigate to the ~/Views/Shared folder of your web project. Create a folder named "EditorTemplates", if it does not already exist. Inside of this folder, create a partial view with the name of your type. (DateTime, in our case). 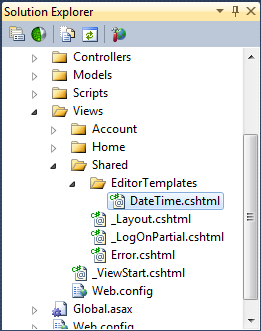 Now, MVC will automatically select our editor whenever it has a DateTime or a Nullable<DateTime> to render. MVC will automatically round-trip the data and perform model binding, if it is rendered in a certain way. Interestingly, we are passing an empty string in for the "name" parameter for the text box. This is the secret sauce for getting MVC to render the proper name to support complex models and for it to automatically round-trip the model for. Second, we are simply passing the model as the value of the text box. MVC will take this and call ToString() on the value, which will give us the default formatting for dates. This will not prevent the users' input from round-tripping, but will instead provide a default formatting for views where there is no posted data to reference, e.g. loading the edit view for the first time. Some people prefer to have a single script for wiring-up their date-pickers at the top of the page. I find this to be less than ideal, because I usually don't date pickers on a page, so it doesn't belong in the master layout. I also don't want to duplicate the code on every page, because it means that a simple change to the date picker would have to be performed in many places, and it could easily be forgotten on a page, preventing date pickers from working there. With that in mind, my preference is to have a self-contained script for creating the date-picker immediately following the text box. The challenge that we face when we want to do this is coming up with a way to refer to the specific text-box in a jQuery selector. The easiest way, from a jQuery standpoint, would be to use the ID of the text box. Now, we have a feature-complete, self-contained date picker, that is automatically applied for all DateTime fields!